It's Muffin Tin Monday again, and I thought we'd give our new bug tin that we found at TJ Maxx a try this time. Cort had the same foods, but he had his in our Wilton clover tin. So Reid had a small slice of blueberry apple pie (made from our apple trees), a slice of garlic bread, watermelon (yes, we still have a few in our garden! ), some vegetable meatball soup, and peach yogurt. I don't know about you, but this time of year I go crazy for homemade soups. They are economical and easy, and my boys seem to love them. I just make them extra chunky so we don't have as much of a mess to clean up. The boys both ate the yogurt first (and begged for more) followed by the watermelon and apple pie. Then they had the soup (they really do love soup, they were just tempted by the sweets first), and neither of them ate the garlic bread. Which meant the garlic bread fell to me to finish off, because I hate to see a good bread go to waste! Love this tin and the food looks yummy! What a wonderful meal. I think JDaniel would eat the worm first. What a cute tin!! Like you, this time of year we start thinking SOUP. My Hubs loves soups.... I just got most of the ingredients so I can make a big pot of Wedding soup and freeze it. Everything in your tin looks great, Bet the kids love doing this. Serve me a slice of that homemade pie! YUM!! What a nifty meal. You're so creative! I really hope to get my boys to like soups more. They haven't been big fans. And I love soup and homemade bread this time of year! I would be glad to eat the garlic bread, but my kids like it. :( Wink! What a cute and fun lunch! I love homemade soups this time of year too-they always taste so good on a fall or winter day. How cute! 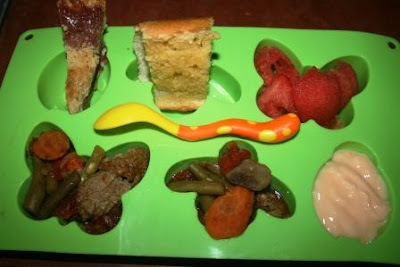 I wish I had known about or been clever enough to think of these muffin tin meals when my kiddos where younger! sounds really healthy and good for this time of year. While it has cooled here a bit (low 100's) it just isn't cool enough yet for me to start making soups/stews. I like them because I can make a batch on the weekend & take it in my lunch all week. I would eat every single bit of that, including the garlic bread! YUM!!!! I LOVE homemade soups...and that's so me with the bread! What a cute idea! And what great muffin tins! butterfly muffins are awesome. That's so cute! I love soups this time of year too! Just had chili with peanut butter and honey for dinner but I'd love to have some of your chunky veggie soup! Oh sweetie, what a grand idea for both you and the kiddos. There's nothin' like a 'fun' meal! lol I finished off my daughter's garlic bread tonight for the very same reason! I love these meals that you fix for your boys and wish I had done this type of thing when my kids were younger. Love that tin! So cute. I love soup too... so glad it is finally fall. I love making soup in the slow cooker in the fall. That pie sounds delicious! I love soup this time of year too...so comforting. The Blueberry Apple pie looks really yummy! Man,I want to come to YOUR house for snacktime!